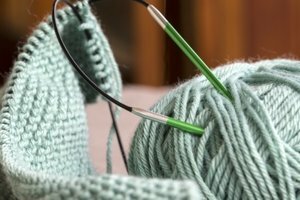 Why Use Circular Knitting Needles? Circular knitting needles are not just for knitting in the round. They are also a miracle tool saving you pain in your wrists, arms, shoulders and back when knitting flat! That’s right… use circular knitting needles to “take a load off” larger projects like baby blankets (my favorite), throw blankets, shawls and so on. Larger projects are also a real pain to try and fit on straight needles, which not only makes them heavy but all bunched up. Why not do yourself a favor and take the pain out of the project by choosing a circular needle of a size appropriate to your larger project. I use 32″ size primarily for my knit baby blanket designs but have also used 36″ and even 40″ for throws. You also don’t want to go overboard and have a length that’s too long and impractical to load a small number of cast on stitches. But if you are using super bulky weight yarn and/or cast on north of 60 stitches, consider circular needles instead of straight. Your project weight can simply rest in your lap as you knit away, enjoying your project and joyfully noting your progress instead of the twinge in your wrists and the dull ache in your shoulders! https://www.calichicbaby.com/wp-content/uploads/2018/03/CCP-site-logo2.png 0 0 Cali Chic Baby https://www.calichicbaby.com/wp-content/uploads/2018/03/CCP-site-logo2.png Cali Chic Baby2019-04-10 23:01:202019-04-13 20:44:03Why Use Circular Knitting Needles?